إن فندق Quarterdeck Apartments بموقعه الممتاز في سارفرس باراديس هو نقطة انطلاق جيدة لنزهاتك في جولد كوست. يمكن من هنا للضيوف الاستمتاع بسهولة الوصول إلى كل ما تقدمه هذه المدينة النابضة بالحياة. إن سهولة الوصول من الفندق إلى المعالم السياحية الشهيرة الكثيرة في المدينة كمثل Slingshot Gold Coast, Adrenalin Park, King Tutts Putt Put هو استثنائي بحد ذاته. 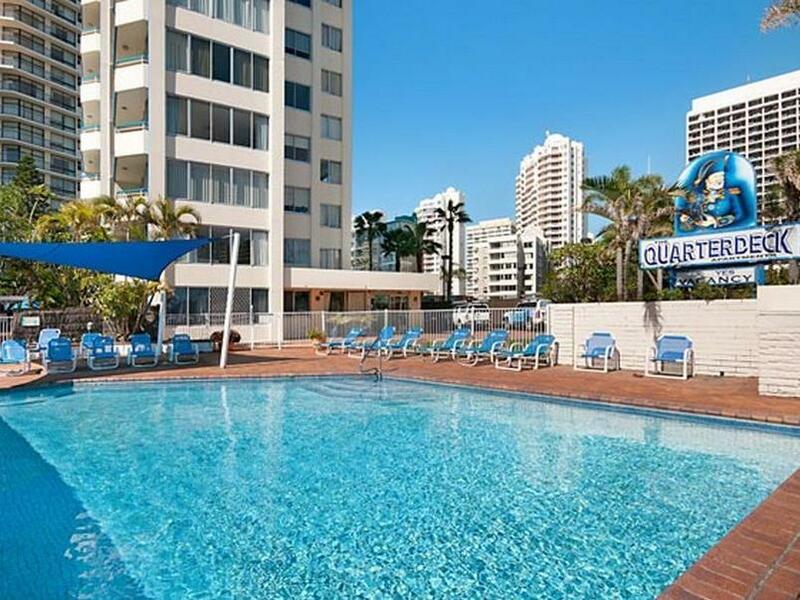 كما يقدم Quarterdeck Apartments الكثير من الخدمات لإغناء رحلتك في جولد كوست. إن تسجيل وصول/خروج سريع, تخزين الأمتعة, صف السيارات, مركز رجال الأعمال, مرافق للشواء هي جزء فقط من الخدمات التي تميز Quarterdeck Apartments عن باقي الفنادق في المدينة. يمكن للنزلاء الاختيار من ضمن مجموعة من الغرف المصممة بعناية لتعكس جواً من الراحة، والتي يتجاوز عددها 54. صممت خدمات الاستجمام في الفندق والتي تتضمن ساونا, مسار جولف - ضمن 3 كم, حمام سباحة خارجي, حمام سباحة داخلي, مسبح (للأطفال) لمساعدتك على الاسترخاء والراحة. اكتشف مزيجاً ساحراً من الخدمة الاحترافية والخيارات الواسعة من وسائل الراحة والمتعة في Quarterdeck Apartments. My assumption is that the apartments are individually owned, and the one I had was not maintained. Scuff marks on all the walls, cupboard doors broken, not coat hangers, windows dirty. There was a building site next to the apartments, this was noisy and an eye sore. There was no mention about this when booking. The apartment good have been cleaned a little better, there was still crumbs or something on the kitchen worktop. The location was good for us as we wanted it to be close to surrounding amenities. we stayed in apartment 113 and the apartment needed a complete overhaul the kitchen had hardly anything to cook with the oven door hit the floor when you opened it fridge door didn't close properly. When l arrived was told there were two single beds in room and if l wanted them put together l would have to wait until the next day when housekeeping came so l did it myself. Had air conditioner in lounge and ceiling fan in bedroom and a nice view of ocean from balcony the lounge room had a lamp with a broken switch that was sticky taped up with a little note on it saying please use power point to turn lamp on so dangerous if you had small children. The best thing about the stay was the location one block from the beach and 5 min walk to shops. We booked room with air condition but when we checked the room there was no air condition and property needs badly renovation as well proper furnitures. Over all we are not happy and we will not go back to this place again. Good value for money in a great location. Any bad reviews are from people who expect 5 star when paying 2 star price! 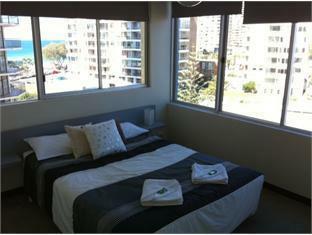 very good location which is nearby the tram station. Rooms a bit old, need to do some renovation and the lift does not have ''close'' button; was like living in the 1970's. Summary: Good Location. Old and very dated but you expect that for the price. Still Good value for money.Walk to everything. It seemed pretty clean but then I found disposable gloves next to the sofa and a ladies shaver on the lounge floor in plain sight and the previous occupants used towels had been left in the bathroom on the towel rack?? Very odd. I would have thought a cleaner doing a good clean would have found all these?? - lol. I told reception and they didnt seem concerned even though they did apologise. If the apartment was clean, the indoor pool had less chlorine and the manager actually cared then I'd give it 5 stars. Im more than happy to stay in budget places and don't need glitz and glamour but my apartment was filthy. The shower was mouldy, the washing machine was mouldy, around the sink was mouldy, the drain on thr bathroom floor was putrid, the piece of carpet being used as a bath mat was full of hair underneath, there was a huge tub of tile adhesive under the kitchen sink that stunk, the hall cupboard was full of rubbish and the mop head was horrid. The indoor pool turned my new black shorts and my sons black undies brown and my daughter ended up covered in red blotches after 10 mins in there because there was so much chlorine in it. I approached the manager who didn't really care and it took my husband calling for him to clean the cupboards out. He took the mat but didnt clean and put the new one on the hair. The leather on the couch was peeling too. It's cheap and nasty!! Not worth the money and it's in major need of a revamp like yesterday!!! Dirtiest place I've ever stayed, room wasn't serviced the whole time we were there, couldn't even get coffreception no help with directions, indoor pool caused damage to both swimwear and jewellery. The pools were to deep for young children this should be noted on the web site, the games room was non existent, in the basement car park consisting of a ping pong table with no bats or a ball and a dart board with one dart. I had to do last minute booking, after booking I checked the reviews for the appartment and they really concerned me as if I was to stay in a terrible room but the outcome was opposite really easy access, staff very helping, clean and tidy room, spacious and great views in appartment due to window wall, no problem with parking. On the whole I really enjoyed the stay, I don,t think people should expect room service in this rate. Positives: Great location. Spacious room. Windows all around. Negatives: Run down. Grotty. Staff may as well not be there. You get what you pay for. Couldn't have asked much more for that price, and location was the main factor for us. But if they ask any more than $90 a night, look elsewhere. Well where do I start. Lamp shade in bedroom was broken along with the dryer door, oven door. Carpets were dirty and torn. Room wasn't very clean. Oh and if you check in on a Sunday (checkin is for 2pm) reception is only manned until 12.30pm. So nobody there to check you in. Instuctions are not clear for an after hours checkin and took a while to get a hold of someone that could help. Won't be staying there again.